TAMPA — This, late Tuesday afternoon at George M. Steinbrenner Field, represented why Estevan Florial belongs in the Yankees’ major league camp. This, when the 20-year-old committed what could have been a game-losing gaffe and failed to drive in what would have been the game-winning run. Florial, the center fielder whom Brian Cashman calls a “tool shed” because of his impressive ability to hit, hit with power, throw, run and field, is the talk of Yankees camp despite his rough one-inning stint in the Yankees’ 2-2 tie with the Tigers. The 20-year-old owns a .286/.400/.571 slash line in 15 Grapefruit League games, totaling 21 at-bats, and has people talking as much about his steady head as his explosive athleticism. He stands as the favorite to win the James P. Dawson Award, given annually to the best rookie in Yankees camp, because the club decided to push its most compelling prospect in what has turned into one of the industry’s best farm systems. Jacoby Ellsbury’s oblique and Clint Frazier’s concussion meant that Florial was the obvious choice to relieve Aaron Hicks on Tuesday once Hicks tallied his third plate appearance in the bottom of the eighth, during which the Yankees scored two runs to take a 2-1 lead. Jacoby Jones led off with a single against Giovanny Gallegos and advanced to second on a wild pitch, and Victor Reyes followed by stroking a single to center field. With Jones coming around to tie the game, Florial showed off his monster arm … way too much. His throw sailed far away from catcher Kyle Higashioka, on the third base-side, and that allowed Reyes to go to second. In the bottom of the ninth, with teammates on second and third and two outs, Florial grounded out to Detroit second baseman Harold Castro to conclude the game in a deadlock. One bad inning won’t undo what Florial has done in his camp, further cementing the untouchable status he gained last summer. Florial will start 2018 at Class-A Tampa, where he finished last year, so a big league call-up this season ranks as unlikely. The Yankees hope that his sharing a clubhouse with “a lot of All-Star players here,” as he put it, will enhance his already quick learning curve. Since signing with the Yankees as a 17-year-old, his status delayed by confusion surrounding his identity, Florial has learned both baseball and English at remarkable speeds. 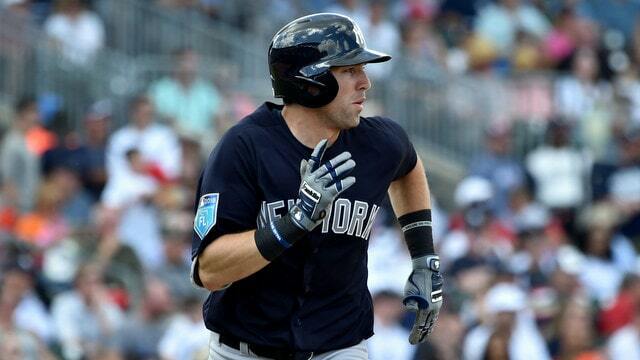 “Now it’s about getting as many reps to refine those tools and see how far it takes him,” Cashman said. He’ll be better for having gone this far this soon, hard lessons and all. Could Domingo German be this season’s Chad Green? German has pitched extremely well so far this spring and is quickly rising up the Yankees’ depth chart. 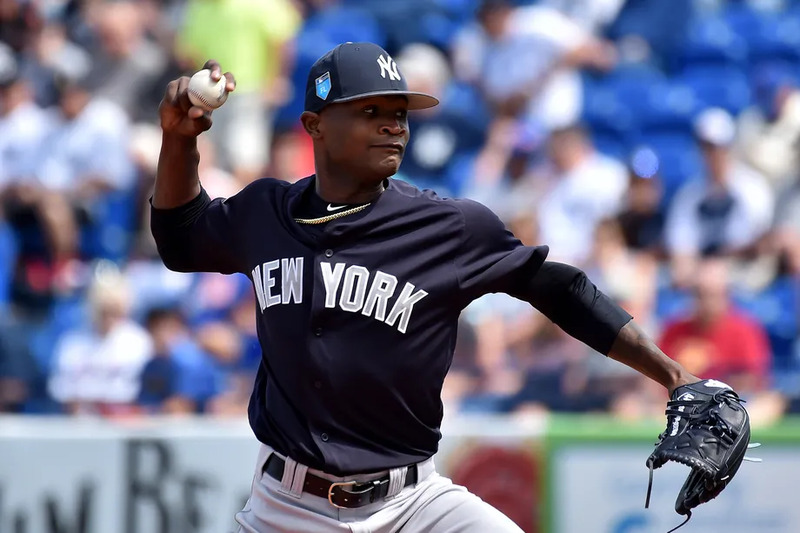 Domingo German has appeared in four games for the Yankees so far this spring. He has allowed one run on seven hits, while walking four and striking out 13 batters over 10 2/3 innings pitched. German’s most recent outing came in relief yesterday versus the Twins. He pitched three scoreless innings, giving up one hit, no walks, and striking out three. It was his most dominant Grapefruit League appearance yet. In his start last Wednesday against the Mets, the right-hander retired the first six batters he faced in order, including striking out the side in the second inning. The punch-out victims were Todd Frazier, Adrian Gonzalez, and Jose Reyes. Unfortunately, German’s perfect outing was spoiled when he walked the first two batters in the third inning. Walks had been his bugaboo during his cup of coffee in the big leagues last year. German allowed nine bases on balls in only 14 1/3 innings while pitching in relief for the Yankees in 2017. The team’s number eighteen-ranked prospect continues to display his greatest asset, that being his ability to rack up strikeouts. German’s high strikeout rate in Grapefruit League action this spring is roughly in line with what he did during the regular season last year (11.3 k/9). New York’s Opening Day pitching staff appears set. Manager Aaron Boone officially announced Jordan Montgomery as the fifth starter last week. The bullpen, meanwhile, will feature Aroldis Chapman, Chad Green, Dellin Betances, Adam Warren, David Robertson, and Tommy Kahnle. Chasen Shreve is out of minor-league options, so he will be the seventh man in the pen. I currently have German listed as the club’s number-six starter, ahead of Chance Adams (who is not on the 40-man roster) and Luis Cessa. German is also battling Ben Heller and Jonathan Holder for the right to claim the eighth spot on the bullpen depth chart. He appears to have a leg up there as well. Chad Green, you will recall, was the runner-up in the fifth starter competition last spring in what was a very close race. Green began the season in Triple-A, and the organization kept him stretched out as a starter in Scranton’s rotation, just in case. As it turned out, the Yankees’ starters stayed healthy until June, but the club needed help in the bullpen much sooner. Green was called up at the beginning of May, and was such a force in relief, that he remained there for the duration. He ended up turning in a historically great season as a reliever, and was a big reason the team got to within one win of the World Series. Green’s pedigree as a starter proved to be an important part of his contribution to the team. Including the postseason, 33 of his 45 appearances were for more than one inning. It’s easy to envision a similar career path moving forward for Domingo German. Barring a spring training injury to one of the pitchers slated to make the Opening Day roster, German will begin the season in Triple-A. Like Green before him, German will probably claim a spot in Scranton’s rotation to stay stretched out. The injury bug will bite the major-league roster sooner or later — it always does. The Yankees used 25 pitchers in games last season. So German is going to get his chance soon enough. If German can continue to make strides in getting his walk-rate under control, the 25-year-old strikeout artist could prove to be a powerful weapon for the Yankees this year. We’ve already covered the much-discussed rules changes at the MLB level relating to pace of play. That is certainly the most pertinent recent development in the rules arena, which has emerged as a point of no little controversy between the league and player’s union. Today, though, the minor-league rule book received some changes of its own, as MLB.com’s Matt Kelly was among those to report, with some notable differences. While these regulations obviously won’t be seen in major-league games, they presumably could be considered for the game’s highest level in the future. Mound visits will now be limited in the minors, much as is set to occur at the MLB level. The already-existing pitch clocks in the upper minors will be sped up. That, perhaps, is the next frontier for the majors, though the clock is not slated to be implemented there in 2018. What has raised the most eyebrows, surely, is a rather notable change in extra innings. In a measure that’s sure both to shorten contests and engender consternation among purists, teams will start each inning with a baserunner on second from the tenth frame on. (The runner will be the player that occupies the spot in the order prior to the one that’s due to lead off the inning.) This procedure was utilized with less-than-enthusiastic reviews at the most recent World Baseball Classic. Clearly, there’s more justification for utilizing this sort of procedure in the minors, where development is still the primary purpose. And it’s far from clear whether there’s any real inclination to pursue such a game-altering approach in the majors. Still, it’s quite a modification and one that’s sure to impact minor-league games across the country in the coming season. According to Ben Badler, the Yankees are the favorites to sign 16-year-old Dominican catching prospects Antonio Gomez and Agustin Ramirez when the 2018-19 international signing period opens July 2nd. Both players were among the standouts during MLB’s international showcase last month. Ramirez, 16, packs a lot of strength into his compact swing, driving the ball to the fence in BP … Ramirez squared up fastballs consistently, though he did have some trouble on breaking pitches. Ramirez’s bat stood out more than his defense, where Ramirez has work to do to improve his receiving and throws to second. The Yankees signed Venezuelan catching prospect Antonio Cabello to an undisclosed bonus back in December, though whatever the bonus is, it was big enough to eat up much of their $3.5M in Shohei Ohtani money. That’s why the Rangers were able to beat them out for Cuban outfielder Julio Pablo Martinez. Texas had bonus money and the Yankees didn’t. Gomez and Ramirez are 2018 international prospects and fall under a separate signing bonus pool. Catcher is, by no small margin, the weakest position in the organization at the moment. Fortunately the Yankees have Gary Sanchez at the MLB level, so they won’t need a new big league backstop anytime soon, but the catcher prospect cupboard is pretty bare. Saul Torres, converted infielder Donny Sands, and soon-to-be 28-year-old Kyle Higashioka are the team’s top backstop prospects. Yikes. Teams generally do not draft or sign players to fill organizational needs. The Yankees tend to hoard talent, regardless of position, then figure out how it fits later. That’s how they wound up with Sanchez and John Ryan Murphy sharing catching duties like three years straight in the minors. Gomez and Ramirez will help address an organizational weakness at catcher and that’s cool. But the Yankees aren’t signing them specifically because they’re catchers. Here are some day one notes from Minor League spring training. We are battling some bad wifi issues but trying to upload the videos to our YouTube channel as soon as we can. TAMPA - Watch Yankees top prospect Gleyber Torres hit a home run to right field in his first minor league spring training at-bat at the player development complex Friday afternoon. Torres was hitting third and playing second base for Triple-A Scranton/Wilkes-Barre against the Pirates' Triple-A club. "It's not often you see nine months of no games and come back perfect," Torres said. "I'm human. I'll stay focused and go wherever they tell me and wait for another opportunity." "I think he has played well," Boone said. "At times at the plate, I think we've kind of seen him in that wanting to make up for last time (mode), wanting to prove himself a little bit to a degree." "Obviously he's about as highly touted as anyone, and that's only been confirmed in my eyes and it may even be taken to another level," Boone said. "There's no question to me the kind of player he is and is going to be. "From the bat standpoint, I know a lot has been written about him not getting a lot of hits ... It's a matter of time. He's a really, really talented player But as much as anything, I love the intangible part of him. He's just got a great clock out on the field, a great little presence to him. He knows he's a good player. More video is coming soon. I will be posting the photo gallery soon as well. Today Judge had just one putout in the Yankees minor league spring training, check out the photo and more in our daily MiLB spring training game notes.